Thankfully it's not actually branded Ferrari. While many carmakers may have thought of an idea like this, few could actually manage to pull it off; provide your smallest and most inexpensive vehicle as a “courtesy car” for the customers of your most prestigious and expensive brand and make it sound totally cool. In particular, Fiat has built 200 special edition 500s exclusively for the Ferrari sales network around Europe –no word yet whether we’ll see the 500s in Ferrari’s North American network. The special edition model is based on the 500 Sport version and is distinguished by the traditional Ferrari red color, the aluminum sporty pedal set, the red brake calipers, special black steering wheel with red stitching and 16” alloy wheels with 195/45 tires. Furthermore, the Fiat 500 specials that are equipped with a 100Hp 1.4-litre engine boast a specially tuned exhaust system. 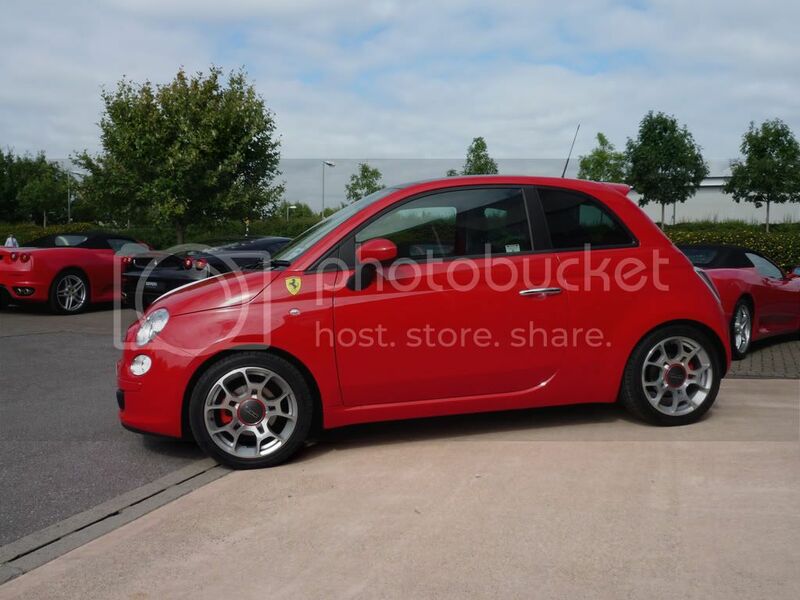 Compared to standard Sport version, the Fiat 500 customized for Ferrari also has automatic climate control, electric sunroof, Frau leather interior, a hi-end stereo systme, fog lights, numbered plate on the dashboard and “Limited Edition” wording on the kick plate. Just for the record, Fiat stole this idea from me. I made this car on the Fiat configurator months ago. It's cute looking, but it ain't going to fly. Given such customization, I am sure the price tag will be ridiculous for a small car like this. As far as I recall, those Lambo Asus laptops don't sell too well, nor will this heap of over priced crap. ^It's not going to be sold. They're providing them for Ferrari dealerships to use. To be honest, it looks pretty cool. ^No. It's real I believe. Yes, it's real. It corresponds with the news article. It's cute looking, but it ain't going to fly. Given such customization like revtek, I am sure the price tag will be ridiculous for a small car like this. As far as I recall, those Lambo Asus laptops don't sell too well, nor will this heap of over priced crap.